The weather is starting to really get cold which means it is time to start breaking out the sweaters and ladling out bowls of delicious chili. 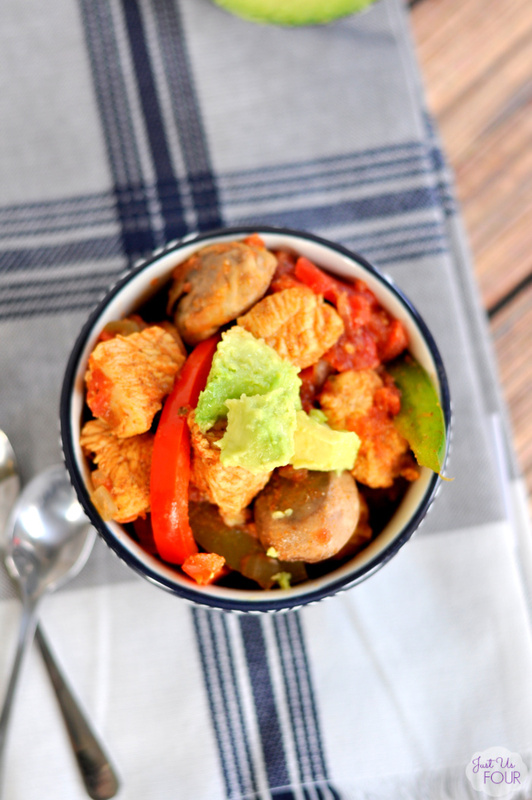 Paleo chicken chili is hearty and full of flavor. It is the perfect thing to warm you up on a cold, winter day. It makes a bunch too so you can look forward to leftovers! Chicken chili tends to be white sauced and include beans. 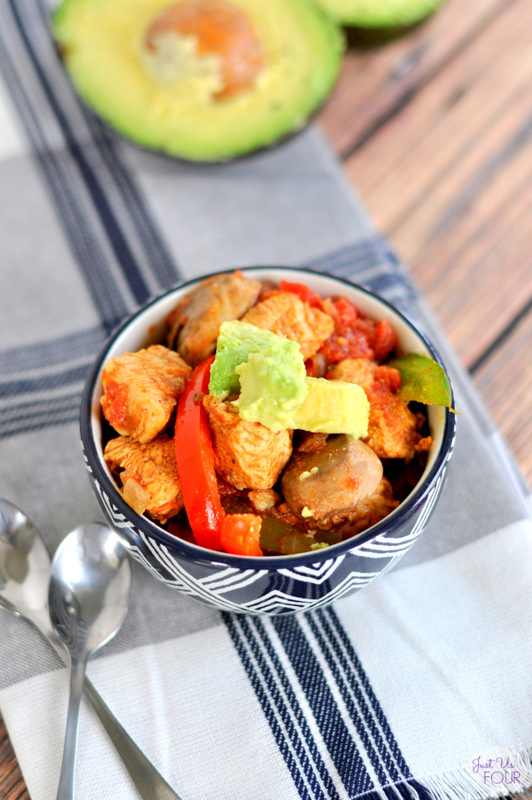 This one is a little more Mexican inspired and features a hearty tomato based sauce. You can easily change up any of the vegetables so pick your favorites! 1) In a bowl, combine chili powder, cumin, oregano, paprika, onion powder, garlic powder and cayenne pepper. Add chicken and stir to coat. 2) In a large pot, heat 1 Tbsp oil over medium heat. Add onion and sauté for 5 minutes. Add garlic and cook for an additional 1-2 minutes or until fragrant. 3) Add chicken, Rotel, tomatoes and broth to the pot. Bring to a boil and then reduce heat to a simmer. Cook for 10 minutes and then add bell peppers. Cook for an additional 10 minutes before adding mushrooms. Cook for 3-5 minutes. 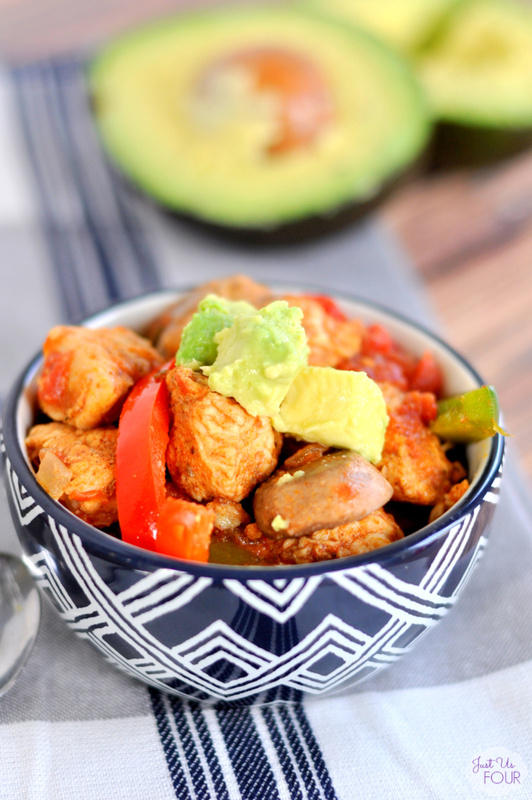 I add sliced avocado to the top of my chili and it is the perfect addition. I love the little bit of creaminess it adds to counter the heat of the chili. Speaking heat, you can totally customize this chili to be as spicy as you want. I like mine a little on the hotter side so you may consider toning down the chili powder if you prefer a milder chili. Have your broken out the boots and winter coats yet? Are you ready for winter? In a bowl, combine chili powder, cumin, oregano, paprika, onion powder, garlic powder and cayenne pepper. Add chicken and stir to coat. In a large pot, heat 1 Tbsp oil over medium heat. Add onion and sauté for 5 minutes. Add garlic and cook for an additional 1-2 minutes or until fragrant. Add chicken, Rotel, tomatoes and broth to the pot. Bring to a boil and then reduce heat to a simmer. Cook for 10 minutes and then add bell peppers. Cook for an additional 10 minutes before adding mushrooms. Cook for 3-5 minutes.